You'll find important information & tips on ventilation, lighting kits, common plant diseases as well as free potting bench plans. For technical specifications, how to apply, cut and clean polycarbonate panels visit our Lexan Corrugated and our Lexan Thermoclear web pages. See the Clarity of polycarbonate. We use Red Cedar for our greenhouse kits because of it's resistance to rot and insects as well as it's beauty & workability. Ventilation is the exchange of inside air for outside air to control temperature, remove moisture and replentish carbon dioxide (CO2) that's necessary for photosynthesis. Excellent ventilation and air flow are important factors in a thriving greenhouse. Without proper ventilation your plants become prone to a myriad of diseases and pests. Good ventilation inhibits pest infestations and promotes pollination inside the greenhouse by both insects and wind. 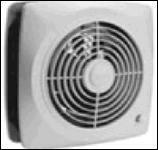 Good air circulation will also reduce the occurance of mould, mildew and other plant diseases. For example white flies hate a breeze. Selecting the proper exhaust fan and vent kits for your greenhouse can help to alleviate most of the problems mentioned. 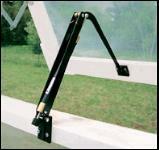 Keep your greenhouse clean and dry to prevent disease and pest infestations. Natural ventilation uses roof vents on the ridge line with side inlet vents (louvers). Warm air rises on convective currents to escape through the top drawing cool air in through the sides. The Sun Country Greenhouse kits have continuous roof vents (six or eight) and a removable rear window where an exhaust fan can be easily installed. 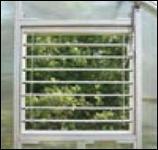 Mechanical ventilation uses an exhaust fan to move air out one end of the greenhouse while outside air enters the other end through motorized inlet louvers. Exhaust fans should be sized to exchange the total volume of air in the greenhouse each minute. 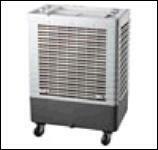 Below from left: evaporative cooler; shutter vent; exhaust fan; auto vent opener. Plant health depends on good nutrition and environmental control, this is the first line of defense against both pests and diseases in any hobby greenhouse. Diagnosing plant problems is a learnable skill that gets easier with experience. Making a proper diagnosis may require the help of a university or private laboratory, but growers can often combine their background knowledge with careful observations to make a good working diagnosis. 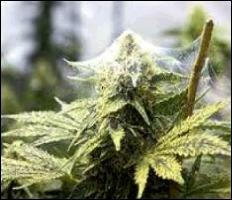 Here are some tips for diagnosing your pest problems in a hobby greenhouse. Look closely at individual plants, noting which leaves or other parts exhibit symptoms. Use a magnifying tool to look for signs of the presence of arthropods (the pests themselves or eggs.) mould, and fungal spores on the top and bottom leaf surfaces. Remove a few plants from their containers. Look for poorly developed root systems, scorched tips, soft decay, discolouration, or evidence of feeding on roots or root hairs. Don’t forget the big picture. Do symptoms occur most often near doors, bench edges, where the roof drips, or where flood floors drain most slowly? If the answer to any of the above is “yes,” cleaning up standing water might be a good start toward containing or even solving the problem. Consider the history of the crop and your operation’s cultural practices. Have any materials been used on this crop for the first time, or have you recently used a familiar material at a higher rate than usual? Consult reference books, Extension literature, and notes from grower seminars. Talk with experienced growers, extension agents, and consultants. Form a tentative diagnosis, and send samples representative of early and intermediate stages of the problem to a diagnostic lab. 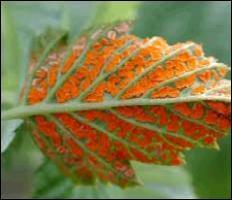 After determining the problem, discard plants with contagious diseases and take appropriate control measures. Continue to watch the crop carefully. The initial diagnosis may only be telling part of the story. For example, you found the fungus gnats and treated the crop for them, but the Pythium infection they were carrying might not show up until later. 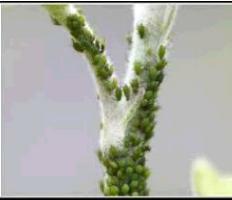 Below from left: Rust, Spider mite and Aphid infestations. If you live in a hardiness zone where you can use your greenhouse during winter months fairly efficiently you will still need supplemental lighting. Plants "survive" with 9 or 10 hrs of sunlight but do not thrive or produce flowers and fruit. Visit a commercial greenhouse and you will see lots of HID lighting. High Intensity Discharge (HID) Lights. These are the same powerful lights used by professional growers and come in kits; a bulb, ceramic fixture, ballast and hood. HID lights are highly energy efficient. You can grow any plant, anywhere, anytime you choose. The “high intensity” light energy is effective much farther than fluorescent: 250 watt/3 ft., 400 watt/5 ft., 600 watt/6 ft. The 400 watt is recommended for most hobby greenhouse applications. High Pressures Sodium (HPS) kits: This light has extra output in the yellow, orange and red spectrum which increases flower quality and size. It is the best choice for use in a greenhouse. 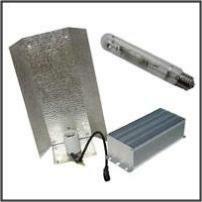 Metal Halide (MH) kits: A full light spectrum is the advantage of MH. It is the most effective light for use indoors where there is limited sunlight and for the vegetative growth stage in a greenhouse then switching to sodium bulb for flowering. 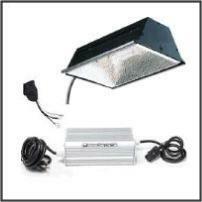 Fluorescent Light kits: These lights are recommended for starting seedlings and cuttings. They are also popular for growing some herbs and other low-light plants like African violets. Fluorescent lights are “low intensity” and need to be within 6" to 8" of the plants to be effective. From bottom left: High Pressure Sodium kit; Metal Halide kit; Fluorcent Lights. Some plants that can be grown reasonably well in a hobby greenhouse during winter. Supplemental lighting may be required to lengthen hrs. of light, for instance HID Lighting (high pressure sodium and metal halide) and fluorescent lights. Excellent: Basil, celery, dill, fennel, kale, leaf lettuce, marjoram, mustard greens, oregano, parsley, spinach, Swiss chard, and turnip. Good: Cabbage, collards, garlic, green onions, leek, cherry tomatoes and cucumbers (European type) are considered good but require warm temperatures. Fair: Broccoli, edible pod peas, eggplant, large tomatoes and peppers are considered fair, but require warm temperatures. Poor: Beans, carrots, corn, radishes, turnips. melons and squash are considered poor because they are naturally pollinated by bees. If hand pollinated they can be listed as fair. WARNING: Polycarbonate and Mosquito Repellant don't mix: One day I was assembling a roof section of a kit using Lexan Corrugated polycarbonate panels. The mosquitoes were pretty hungry and entering my shop to feast. West Nile is pretty wide spread in Manitoba and elsewhere and a few have gotten quite ill so I decided some "DEET" would be better than getting infected. I sprayed myself too close to the panels. The next day I noticed the Lexan had cracked around a couple of TEK screws and you could see where the repellant had been sprayed on the polycarbonate. It had turned opaque and had hairline cracks. In short is was ruined. This is not a warranty issue or any design problem with the Lexan. There must be some kind of petrochemical in the Deep Woods mosquito repellant that reacts with the polycarbonate. G.E. Plastics warns against cleaning with petroleum based solvents. So be warned don't spray insect repellant near your greenhouse if it has a polycarbonate covering of any kind. 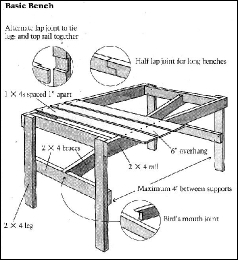 A greenhouse potting bench or gardening table is a workbench used for greenhouse gardening tasks such as making seed trays, transplanting seedlings and re-potting plants. 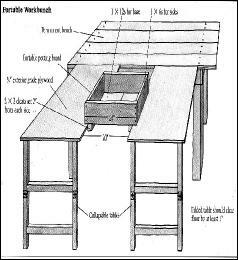 A basic potting bench has a work surface at bench height comfortable for a standing person and storage for potting soil, pots and tools underneath the potting bench. 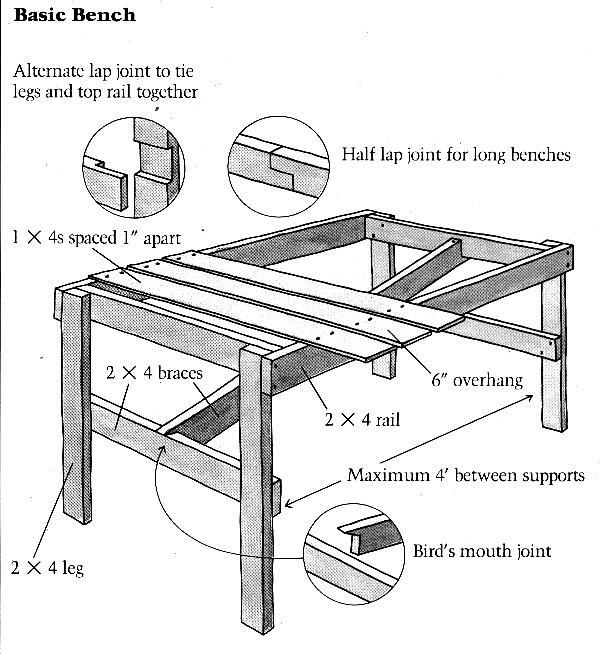 This type of bench is often exposed to soil, sunlight and water and it should be made from weather-resistant materials and stained if it's not to rot, Cedar and Redwood are popular choices. Plastic potting benches are cheaper and for those who can afford it there is teak. Metal construction could be an option only if corrosion can be controlled. Some potting benches are small and portable others are fixed into the side of a greenhouse. They are often custom built by the individual gardener so there is considerable variation in style. Some designs include a dry sink for soil storage and a water or drain hookup. 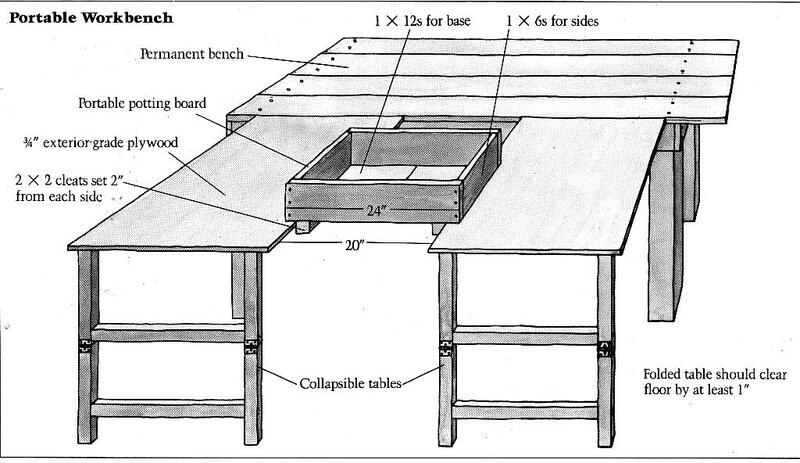 Greenhouse bench plans are available for DIY greenhouse construction. 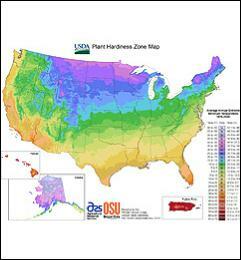 Click on images and Hardiness Zone Map below to expand.